Islamists have played an important part in the uprising against Col Muammar Gaddafi, sparking concern about what role they will play in the new Libya, writes Middle East analyst Omar Ashour. Abdul Hakim Belhaj spearheaded the attack on Col Gaddafi's Bab al-Aziziya compound, but the commander of the newly-formed Tripoli Military Council is raising red flags in the West. Mr Belhaj - known in the jihadi world as Abu Abdullah al-Sadiq - is the former commander of the Libyan Islamic Fighting Group (LIFG), a jihadist organisation with historical links to al-Qaeda, the Taliban, and the al-Jihad organisation in Egypt. Established in 1990, the LIFG led a three-year low-level insurgency mainly based in eastern Libya, and staged three attempts to assassinate Col Gaddafi in 1995 and 1996. By 1998, the group was crushed. Mr Belhaj spent time in the notorious Abu Salim Prison, before being freed in 2010 under a "de-radicalisation" drive championed by Saif al-Islam Gaddafi, son of the Libyan leader, mostly for the benefit of audiences in the West. "The tyrant fled and we will be after him," said a victorious Mr Belhaj following the storming of Bab al-Aziziya earlier this month. The close co-operation between Mr Belhaj and Libya's interim rebel leadership - the National Transitional Council (NTC) - has heightened fears in the West about the possible rise of Islamist fighters within in its ranks. Concerns had already surfaced following the unexplained killing in July of the rebels' military commander, Abdel Fattah Younes, after he was taken into custody by his own side for questioning. Two days after the storming of the compound, US Secretary of State Hillary Clinton called on the NTC to take "a firm stand against violent extremism" - an apparent reference to Islamist fighters. 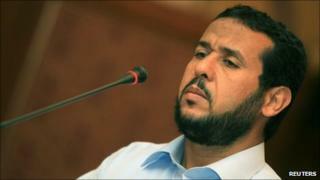 But neither arrogance nor vengeance dominated Mr Belhaj's victory speech to the rebels in Tripoli. Instead, he called on Libyans to safeguard public property, end their vendettas and build a new Libya. The moderate tone is generally consistent with what most LIFG leaders have been saying in the last six months, whether in eastern or western Libya. It seems their experiences in armed conflicts in Afghanistan, Libya and Algeria have forced them to mature politically, re-calculate strategically, and moderate their behaviour and ideology. The former "fighting group" has even toned down its name, becoming the Islamic Movement for Change. However, enforcing a moderate stance among its rank-and-file members will be a challenge for the leadership. In today's lawless war zone, which has placed small- and mid-sized arms in the hands of virtually everyone, conditions can change significantly and so can loyalties and hierarchies. But a former mid-ranking LIFG member - who commands around 300 men from the coastal city of Derna - said the group has no ulterior motives. "We are not trying to establish an Islamic emirate," said Abdul Hakim al-Hasadi. "Look around you… do you see any camps or a separate force from the rest of the fighters?" The other challenge for the LIFG is to transform itself from a militia to a political party. "We were trained as fighters and theologians, not politicians," said another former member of the group. "So when it comes to democracy, constitution, and elections, the leaders have got nothing to say." Following Col Gaddafi's departure, interactions between the NTC and armed Islamist organisations can take three trajectories: reintegration, inclusion or clash. Reintegration in the military and security forces will depend on their size and contribution, and of course, the political will and calculations of the NTC. This trajectory will not only be problematic for the Western partners of the NTC, but also for the security and intelligence personnel, who will see former "terrorists" transformed into colleagues. The experience of South Africa and reintegration of the Africa National Congress (ANC) fighters comes to mind as a relatively successful case. The second trajectory is political inclusion, which would also face some hurdles, such as the need for mid-ranking and grassroots members to participate in a democratic process, after being indoctrinated for decades into believing that democracy is inherently anti-Islamic. But signs of successful jihadist transformation come from neighbouring Egypt. The Islamic Group, a much larger armed Islamist organisation, has successfully dismantled its armed wing and formed a politically party, Construction and Development. The third scenario is the worst - civil war: Even a small-scale one to oust Islamists would be as disastrous for Libyans and their neighbours as was the Algerian civil war in the 1990s. Unfortunately, this scenario cannot be discounted. A study published by Columbia University has shown that the probability of a country relapsing into civil war following a successful armed anti-dictatorship campaign is 43%. It arrives at this figure after surveying 323 opposition campaigns between 1900 and 2006. Most of the lucky countries that escaped civil war went through a successful disarmament, de-mobilisation and reintegration (DDR) process, in parallel with a serious attempt at democratisation. Libya's NTC, with the support of Nato, has a good chance of avoiding an Iraq- or Algeria-like scenario in Libya. The pillars of their policies towards the multiple armed Islamist groups following the end of the conflict should be rapid disarmament and political inclusiveness. A wide variety of rewards and inducements should be proffered for disarmament, and in the event that mediation is necessary, the NTC should bring in credible scholars and independent sheikhs (local tribal leaders) to negotiate with the heads of armed groups. In all cases, the NTC is likely to meet resistance, and its objectives should then be focused on minimising and de-legitimising resistance. A mixture of the three trajectories could happen, with most of the armed groups reintegrating in state bureaucracies or successfully turning to party politics. The rest could keep fighting the new elite as "Nato pawns" and "Western puppets". In neighbouring Algeria and Mali, al-Qaeda in the Islamic Maghreb (AQIM) is using these phrases in its propaganda, with the aim of securing a foothold in Libya. But the propaganda will be challenged by the ones willing to transform - as in Egypt, Algeria, Saudi Arabia and elsewhere. "Our view is starting to change of the West. If we hated the Americans 100%, today it is less than 50%," says Mr Hasadi, the ex-jihadist. "They have started to redeem themselves for their past mistakes by helping us to preserve the blood of our children." Dr Omar Ashour is the Director of the Middle East Graduate Studies Programme at the University of Exeter and a visiting fellow at the Brooking Doha Center. He can be reached at o.ashour@exeter.ac.uk.